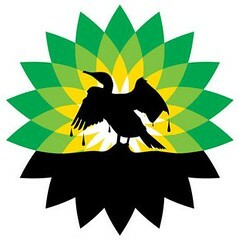 "BP Oil Spill", "BP", "Barack Obama", "Department of Justice", "Eric Holder"
Attorney General Holder announced today that the United States is suing BP, along with eight other companies. And just how much damage does the government want to hold BP accountable for? "Without limitation," according to the suit filed by the Department of Justice. The lawsuit asks the court for civil penalties under the Clean Water Act and to declare eight of the defendants liable without limitation under the Oil Pollution Act for all removal costs and damages caused by the oil spill, including damages to natural resources. So the government is asking that the Court make BP and their buddies pay not only an unlimited amount in actual damages, but additional civil penalties that can run in the billions, reports the Kansas City Star. The lawsuit, the first phase in punishing the parties responsible for the spill, could wrest billions of dollars in civil penalties from nine companies the Justice Department blames, including BP, for allowing an estimated 4.1 million barrels of oil to gush into the Gulf over three months. Because each barrel spilled carries a fine of as much as $4,300, those flow-rate estimates - derived by a government team and already disputed by BP - will be at the heart of the multibillion dollar case. Just doing some quick math here. $4300 a barrel times 4.1 million barrels... that's over $17.6 billion. That's almost an equivalent amount to the $20 billion the President got BP to commit. It's also significant because since Congress failed to eliminate or raise the civil liability cap of a mere $75 million, the Administration is stepping in under the Clean Water Act (as opposed to the Oil Pollutions Act, which sets the limit of $75 million) And that's just the civil penalty, not the damages. When all is said and done, I believe the Obama administration is preparing to teach BP a lesson that not just they but no oil company will forget in the foreseeable future. It seems like much of the country has moved on from the BP oil spill. Once the underwater cameras were shut off, it seemed, the country moved on to the next exciting thing on television. But guess who didn't forget? Barack Obama didn't forget. Eric Holder didn't forget. The government of the United States, under President Obama, didn't forget. While much of the blogosphere and TV punditry is engaged in deciding whether or not President Obama is committed to a set of unbending ideological principles, his leadership in the government has kept it pursuing justice and relief for real people. Yes, when that involves making a compromise so that the unemployed, the poor, the middle class and students can have a fighting chance. And yes, also when it means taking on the world's fourth largest corporate behemoth.